Eight separate medical, academic, tech, sports and cultural meetings and conventions will be taking place in the Destination’s hotels between May and August, generating approximately 8,500 attendees. The Riviera Nayarit is a destination with the service infrastructure needed to host top events as well as meetings and conventions, which will go into full swing starting this month through the end of September. “The meetings and conventions will serve to bolster the slow tourism vacation season in the Destination, which is why our Groups and Events desk is focusing on attracting a variety of these events and encourage them to visit during this period of time, thus benefitting both the organizers as well the hotels,” commented Marc Murphy, Managing Director of the Riviera Nayarit Convention and Visitors Bureau. 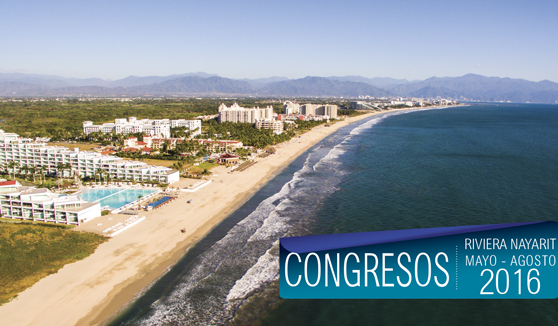 The XXV Congreso Nacional de Química Cosmética will take place May 18-22, 2016. Two hundred attendees plus companions are expected to assist; the event will be held at the Paradise Village hotel. The CXVI Jornada Nacional del Notariado Mexicano at the Marival Resort is taking place from May 19-21, 2016; this academic conference will have 800 attendees plus companions. Another academic conference, the 4º Concurso Nacional de Gastronomía Conalep 2016 "Cocina Tradicional Mexicana", will be held from May 25-27 at the Banderas Bay Technological University. Its 300 attendees will be able to choose their own accommodations. The tech-oriented Congreso My Business Pos will be held from May 26-29, 2016 at the Paradise Village hotel; 200 attendees plus companions are expected to attend. The 2º Congreso Internacional de Turismo & Gastronomía “Tornus” is an academic conference that will welcome 900 students and professionals at the RIU Jalisco from June 2-5, 2016. The Paradise Village hotel will also host the XII Encuentro Nacional Playas Limpias 2016 from June 22-25 with 1,200 attendees from around the country. Of note: the Riviera Nayarit is the national leader in clean beaches. The XXI Juegos Nacionales Deportivos y Culturales held by the Ministry of Environment and Natural Resources (Semarnat by its acronym in Spanish) will be held from July 1-8, 2016. The Paradise Village and other local hotels will welcome the 1,300 attendees. The largest convention to visit the Destination is the Programa de Investigación Científica de Verano “Delfín” in August. The 3,500 attendees will be staying at different hotels including the three RIU properties, Villa Varadero, Occidental and Marival Resort.